Stuff Points: Earn 276 points when you buy this stuff. 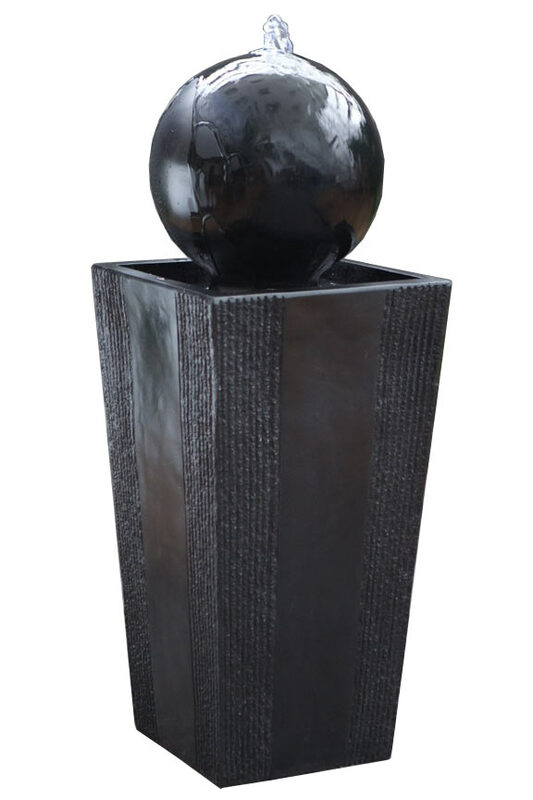 A reflective black ball sits atop a sturdy pillar with dark coloring, and modern styling. This simple and elegant water feature will easily stand out no matter where you place it. Thanks to simple set up and a fully self contained designed, this model can be used inside or out. When sitting among foliage in your garden, it will allow for bold contrast, and if used indoors, it will blend with your contemporary decor. Simply plug in to an electrical outlet and the set up is complete. Once filled with water, it will continuously cycle over and over again to generate the natural sounds of running water that will promote relaxation and block out unwanted background noises. This model comes complete with a powerful pump and one year warranty, and it is constructed from durable fiberglass that gives it the look of natural stone without the weight or expensive price tag. When you turn it on, The GIL786 Ball and Stand fountain will begin to pump water up from the base, through the interior of the ball at the top. Once there, it will begin to bubble up and out in order to gently cascade down the surface. The water will fall down into the tray for collection, only to be cycled back up in a continuous fashion. As the water flows, you will hear the peaceful sounds that the traveling water creates, and this process is as visually stunning as it is pleasing to your ears. Sit back and relax as you watch it while spending time on your deck, or planting flowers in your garden. Included LED lights enhance the look of this model, and add to the captivating nature. It will look great during the day, and when the sun goes down, the accent lighting will keep it looking good, all night long. The affordable materials that comprise the GIL786 Fountain from Alpine allow you to pay a reasonable price while still getting an expensive looking fountain. At first glance, this unit will look like it is carved from natural stone, but when you lift it up, you will know that this can't be true. The fiberglass material looks almost identical to it's natural counterpart, but it is far lighter, and easier to handle, and it comes at a much lower cost. This means that you can have the look of more expensive decor without having to hassle with the installation, or pay the high price tag. You will be able to place this in the exact location you want, and if you change your mind, re-positioning will be quick and easy as well. To set it up, you only have to plug it into an electrical outlet and fill it up with water. There is no technical ability required, and complex plumbing and other difficult situations are not at all necessary. Despite being easier to handle the fiberglass is still plenty sturdy and long lasting. It will not fade, wear or become fragile with age, and it is able to withstand any weather conditions without being harmed. Perfect for the patio, deck or by the pool, this fountain would enhance any backyard decor. Due to limited splashing, and a self contained design, you can also use this model inside as well. Order Yours Today! Ball And Stand Fountain With LED Lights - Simple styling places a slightly reflective ball atop a dark pillar with modern styling. LED accent lighting enhances the look. Order Yours Today!